Mor Kali is a very traditional and authentic dish prepared with buttermilk and rice flour. It is common in Tamil Brahmin families. It can be prepared in a matter of 10-15 minutes and can be had as a tiffin or snack item. You do not need any side dish for this and can be taken as it is. If required, you can have any pickle or just maavadu water as a side dish. I love to have this hot without any accompaniments. This is a very healthy dish which will come handy when you want to satisfy your hunger cravings immediately. What I am trying to say is just take a few minutes to prepare healthy dishes like this when you have mid-morning or mid-afternoon cravings in between meals. Take rice flour in a bowl, add salt needed (approximately little more than 1/2 tsp flat). Then add buttermilk little by little to the the rice flour and mix well so that there are no lumps. Once that is done, add 1 cup of water little at a time to the rice+buttermilk mixture and mix well again. Heat oil in a kadai, add mustard seeds, urad dal, hing and red chillies, when mustard splutters, add green chillies and curry leaves. Then add 1/4 cup of water to the seasoning. When the water starts boiling, keep the flame in low and add the prepared rice+buttermilk mixture stirring continuously. It will look as in the picture below. Keep the flame in medium and cook well. You can check for salt by tasting the mixture, if required add at this stage. Switch off when it starts leaving the sides of the pan. Dip your fingers in water and touch the mor kali, if it sticks to your hand, then cook for some more time. Once cooked, pour it on a plate and serve hot or warm. As it cools it will thicken. Note - Use a little sour butter milk for best results. If you are using mor milagai, then reduce the salt a little. Do try this healthy recipe and give me your feedback. Wow, this is easy & healthy recipe!! Love the texture. I should try this! 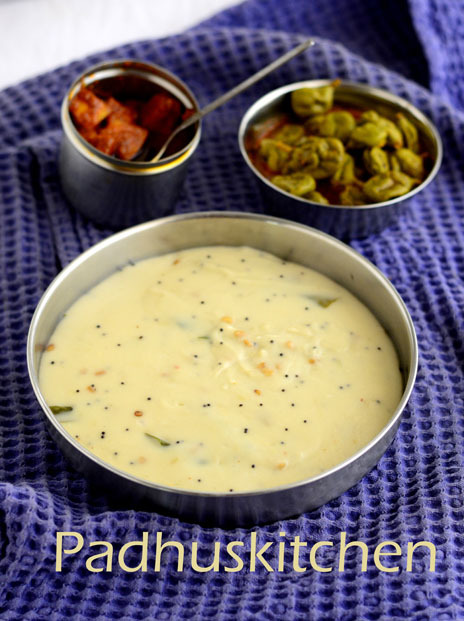 One of my friends was asking me to make this recipe for a long time..thankw for reminding Padhu! Morkali looks delicious! its been very long time of preparing more kali ! thanks for reminding ! lovely mavadu ! Very interesting..Totally new to me..Im sure it makes a tasty & healthy snack!! Tasted it at one of my neighbour mamy's place, delicious mor kali. Gonna definitely try it.. Easy and good looking..
Its been a really long time since I ate Mor Kali.. gosh, how I miss it.. Good one! I love this snack. I make it for tea time. hi this is an excellent recipe for 2 yr children. most of the new mothers would be benifited.u can reduce chilli and try for 1 and half year baby too. Came out very well. Thanks a lot. Am a new cook and I follow your posts almost for every dish I make. Its been great. I was not too sure of preparing this dish. However, I tried it two days ago and liked it so much that I prepared it even for dinner. It tastes lovely and also is filling. Thank you Padhu. Morkali is my favourite recipe. My grandmom used to make this. I'm going to try this like after almost 25+years. Thank you for posting this. In Maharashtra we call this as Ambat Ukad. We use turmeric powder and crushed garlic as well. Its my favorite monsoon food. Although traditionally it is made with rice flr, sometimes I mix Jawar and/ or Raagi flr as well. Try it. Tried it today. Was amazing! Thank you so much. It was just like my grandma's. All your recipes are very good Paddu. Tried making more Kali. It came out very well and tasted awesome. I made slight changes.. Cut them into squares ..that way it's much easier to eat. Came out perfect! Morekali has always been a failure for me till date. Thanks Padhu. I'm planning to try this today. Is the stage suggested by you good for it to be cut into cakes after cooling? If you want to cut like a cake, cook for few more minutes and then leave it to cool. I prefer that semi solid mor kali. Yummy.. was reminded of my mother in law's kali. I always check with your recipes.. more of an authenticity check. Your instructions are clear, step-by-step and encouraging. Thanks. I do prepare but allow it to become like uppuma with crispy bottom.. nice to eat the crispy side too..